Finally after Angie talking about me in the last two novels, you will get to meet me in Murder, Served Simply, out today wherever books are sold. I’m happy for an opportunity to show you who I really am. I know you have heard some bad things. Yes, I broke up with Angie right before our big Texas wedding. Yes, I put my status in Dallas society and my career above her. Yes, I am a jerk. But no, I am a not a bad guy. I have the ability to learn from my mistakes, and leaving Angie was definitely a mistake. It’s one I've regretted every day since. So when her mother suggested I accompany Angie’s parents to Holmes County for Christmas to see Angie, I jumped at the chance. I have a mission. I have made no secret that I am going to win her back. I’m not sure how Angie’s father feels about it, but I do have her mother's Daphne’s support. I am going to need it because Angie and I separate on bad terms. What I didn’t know when I arrived in Ohio was Angie's involvement with a certain police sheriff. I know I broke up with her, but how could she move on so quickly to someone new? And okay, I have dated several women since Angie moved to Ohio but nothing serious. The sheriff is a minor irritation. Angie and I have a history, a long history. What can this country cop have that I don’t? Season's Readings Giveaway! All month long Killer Characters will be giving away books and other gifts this holiday season. Check back everyday to enter each giveaway. 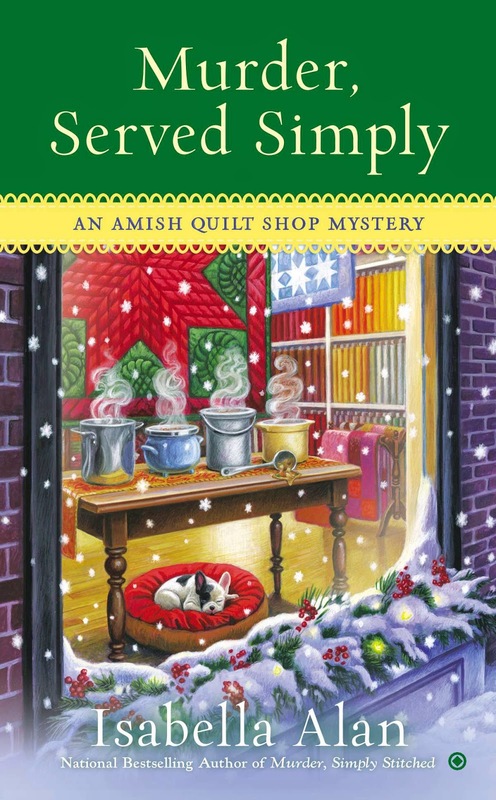 To enter this giveaway and win one of the first two books in the Amish Quilt Shop Mystery Series, MURDER, PLAIN AND SIMPLE or MURDER, SIMPLY STITCHED, please leave a comment with your email address telling Angie if she should pick Ryan Dickinson, the lawyer who dumped her in Texas, or Sheriff James Mitchell, who she met in Holmes County, as her leading man. The winner will be chosen from the comments at 7am on December 3rd. Murder, Served Simply (Amish Quilt Shop #3) released TODAY December 2nd! Oh honey forget about Ryan. He broke your heart. Go after that sheriff. He can take care of Ryan for you too. Go for that yummy Sheriff. Forget about that heartbreaker Ryan. remember the old saying, fool me once, shame on you. . . I believe in second chances at true love. I say go with Ryan Dickinson, the lawyer . The Sheriff I think also..
Definitely Sheriff Mitchell—he's a keeper! No question, Angie. Leave that jerk of a lawyer in the dust and welcome the Sheriff. I'm with everyone else; the Sheriff. I need to catch up on this series; there have been so many new series started in the past year or so that some of them have gotten by me. (Like all good readers, I try not to let that happen!) Thanks for the chance to win wonderful things to read! No contest... Pick the sheriff! No doubt- the sheriff. I really enjoy this series. I think I'll go for the sheriff, too. I'm all for the bad boy....go for Ryan Dickinson! I think the sheriff for sure. Don't get back with a man that left you once before. I don't see that ending well at all. I have to pick the sheriff. Definitely Sheriff James! No matter how many "regrets" a man has, or how much he has "learned", if he left you once, there's a fair chance he'll do it again! I think I need to find out a little more about Ryan before making up my mind, but so far I don't like him very much. She needs to take her time and get to know the new guy better and see if the old one really has changed. I've read the first 2 books - so don't enter me - and the sheriff wins hands down! Love this series! The sheriff is definitely Angie's best choice. Sheriff James Mitchell has my vote. Ryan sounds like a bad boy, and bad boys don't change, IMHO. I don't know about Ryan, he had his chance and he blew it! I want to find out more about this sheriff! Thank you!! Sheriff Mitchell hands down! Send the Texan down the road and keep the Buckeye! (Does it show I live in Ohio??) Thanks for the give away. Angie, forgive Ryan and choose him! He realizes what a dreadful mistake he made! Thank you for the chance to win a book! Ryan has seen the error of his ways. Thanks for a chance to win a book! Sherriff James of course! Loved him in the debut of this series! Thanks for a chance to win the 2nd in this series. Maybe she should choose the sheriff. I hate it when old boyfriends show up in cozies and cause trouble. I live in Ohio and have been to Ashland and Mansfield, where some of the Amish are. I think she should stick with the sheriff. That old boyfriend dumped her once. Who's to say he won't do it again? The sheriff of course. Love those law enforcement. My husband is retired from the state police. The sheriff is the one for her. Stick with the Sheriff-can't resist a man in uniform! The sheriff, of course! Who has time for someone who didn't think you were good enough the first time around. The Sheriff, don't go with a man who has dumped you! Oh Angie don't go back to that loser lawyer that broke your heart when he canceled your wedding. Stay with Sheriff James Mitchell and start a new life. Mary, you won! You should have an email in your box! Sheriff James Mitchell has my vote! I vote for Sheriff James!!!!! Although I do love 'second chances' in love, I think I'm going to have to go with Sheriff James Mitchell. Not sure why, unless it's because I just got to watch all 3 seasons of Longmire this past week - and Longmire is a good sheriff. Looks like Sheriff wins this one. Angie, here's what you do, Sweetie. You innocently ask Ryan if he is willing to relocate so you won't have to give up your shop and the new life you've been working so hard to establish. When he says no, (and he will), then you send him packing. And yes, definitely give that sheriff a chance, but don't be in a rush to commit to him either. Watch, wait and see! Who won on Dec. 3? If you post here, we'll be duly notified. Thanks.